If it wasn't for the central heating and electricity here at Saija, you could be forgiven for thinking you had stepped back in time. This is a simple place, there's no rush, no hurry and no wild night life. 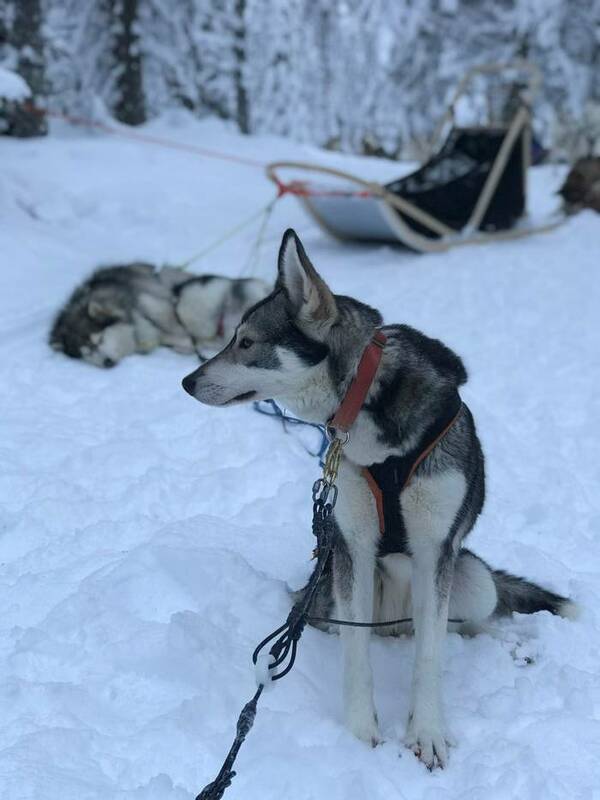 Go dog sledding by day and enjoy a sauna and the chance to catch up on your reading at night – unless the Northern Lights make an appearance of course!! Saija Lodge is the perfect place for enjoying the silence and natural beauty of the unspoiled northern landscape in a homely and friendly atmosphere. Here the chefs spoil you daily with traditional Finnish homemade delicacies. Come and experience the excitement of husky safaris and activities in the snowy winter wilderness. Saija is not about going wild, but being free. Escape to this snowy wilderness over seven nights and enjoy an epic dog sledding adventure. You’ll return home feeling refreshed and invigorated having recharged your batteries Saija-style. *Arrivals which don't meet the group transfer times will be subject to a private transfer supplement. Please note that those departing on 06 April may have to wait for around an hour for their group transfer. Saija is a vision of just how you imagine the Finnish wilderness to be. 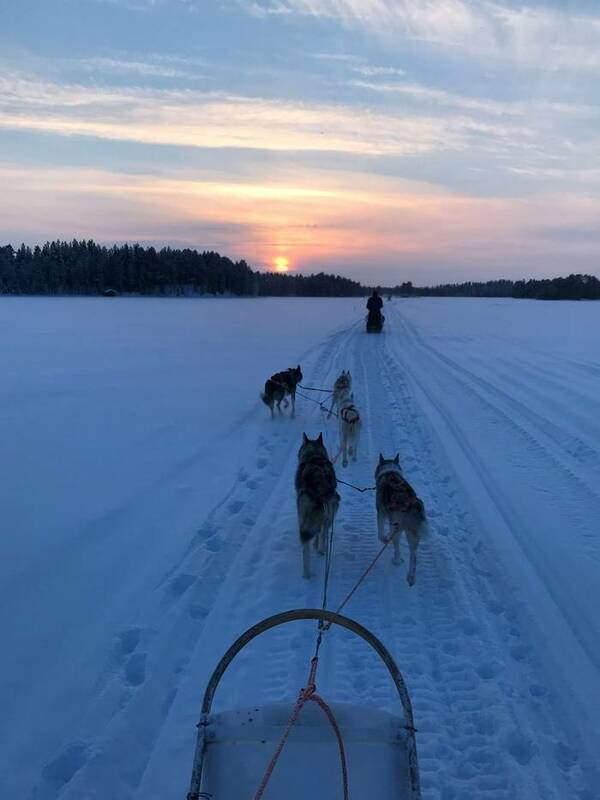 Located on the shores of Lake Jokijärvi, this trip combines the excitement of dog sledding with spectacular surroundings and time to relax. When it comes to the husky safaris, you will take charge of a team of four to six dogs. 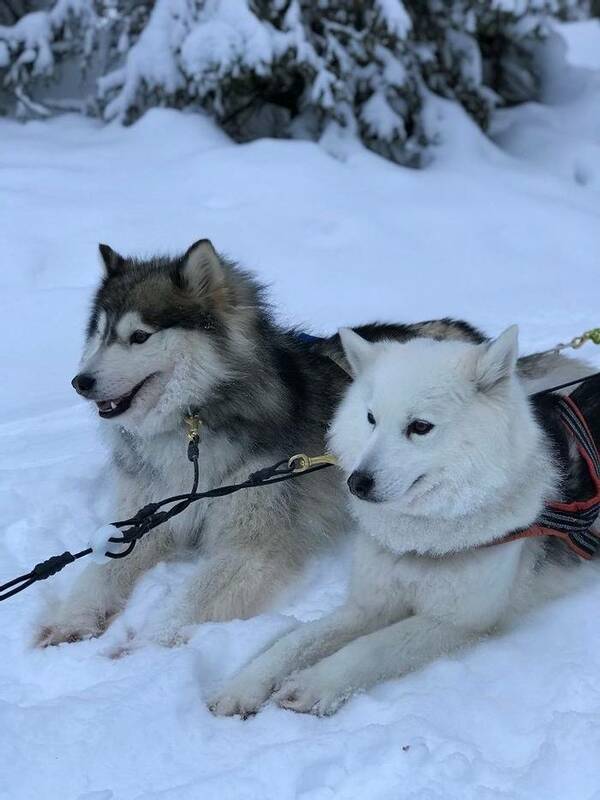 You will drive with the same husky team for the duration of the trip so that you can build a trusting relationship with them throughout the week. You will never forget the thrill of driving with these eager, dedicated animals through North East Finland's huge forests and over its frozen lakes and marshes. At Saija, the scenery is ever-changing and awe-inspiring all the way. Around the lodge, there are many cross-country ski and snowshoe trails for exploring on your free day. There's also a chance to try out additional activities, available from 23 December onwards – see the ‘Personalise’ tab for more details. A highlight among these is snowmobiling, which is a thrilling option. From the moment you step through the door of Saija Lodge, you will sense the restful and homely atmosphere that the team here work so hard to maintain. Instant relaxation is inevitable, as you are welcomed into what feels like home and introduced to the other guests. From meals to activities, and even during your free time, you will feel part of a community in this cosy accommodation. 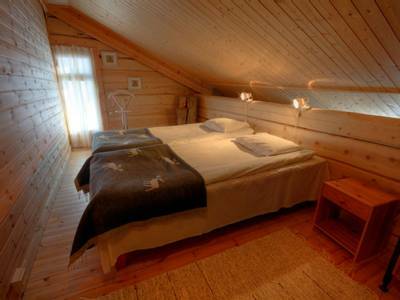 Staying in pretty log cabins at the all-wooden Lodge, your own private sauna helps you unwind and feel even more refreshed. 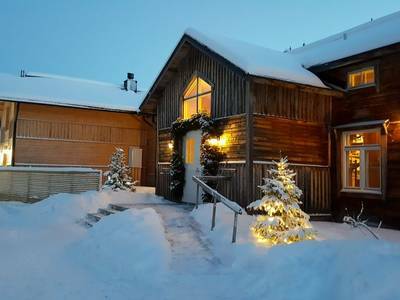 The cosy restaurant is a short walk away and is where you will enjoy traditional Finnish home-cooked specialities and can chat with other guests after a day of dog sledding adventures. Suitable for: Anybody over the age of 15. See our terms for further information. You will be met on arrival at the airport and transferred directly to Saija Lodge. After some time to settle in, your welcome dinner will be served in the main building. Enjoy Finnish homemade food and the chance to meet fellow guests about to embark on a week of – what is for most – first-time experiences and adventure. During your stay at Saija, the guides will gather the group to host a discussion about the Northern Lights. They will speak to you about the science of the Northern Lights and some of the fascinating myths and legends the local people believed before science was able to explain this incredible natural phenomenon. This special evening will be confirmed upon your arrival at Saija. An afternoon in a smoke sauna is also included in your holiday price and will be arranged on arrival. 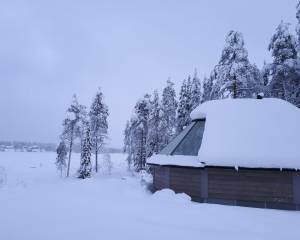 From 14th January, Saija builds a small snow igloo and the chance to spend a night in the igloo is included in the cost for all guests staying at the lodge. The night it is available to you will be confirmed upon arrival – this truly unique experience really is yet another memorable highlight for many of our guests in Saija. Your guide will discuss your itinerary with you and get you kitted out in all of the cold weather clothing that you require for the duration of your stay. You can also join a tour of the facilities with your guide and see what there is to do in and around Saija – now is a good time to book any extra activities for your last day back at the lodge. 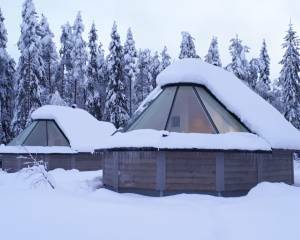 These are available from 23 December onwards and include snowmobiling, snowshoeing and cross-country skiing. If you are on our Christmas trip departing 23rd December, you will take part in a special festive programme after your introduction. There will be Christmas tree picking followed by lunch with a traditional Christmas porridge. In the afternoon, you will carry candles over a frozen lake to Church Island. On your return to Saija, there will be a drink of warm glög (Finnish mulled wine) and a delicious Christmas dinner. A visit by Santa will follow, followed by an evening trip to the Christmas church. If you are on our New Year’s trip departing 30 December, your Introduction Day will finish with a pleasant evening walk to Kallioniemi Museum, which was once the home of renowned local writer Kalle Päätalo. Back at Saija, the New Year’s programme will get underway, with a crackling fire in the on-site kota (a type of native tent), a session of tin-casting (traditionally performed in Finland to predict what the New Year will bring), and drinks as the New Year begins. After breakfast, your guide will take you through all aspects of the husky safari, outlining the all-important safety and giving advice on how to best to work with and guide your dogs. You will then get to meet your eager team of huskies. Each participant has a team of four to six huskies. You are responsible for the dogs' care throughout the safari. You will have the chance to practice with them and begin to build up a relationship on a 13km training run in the area around the lodge. The feeling you get from working with and encouraging your dog team is something that will stay with you forever. The adrenalin and the feeling of excitement as you head away from the husky farm and into the wilds is second to none. In an intriguing contrast, there's an intense feeling of peace and serenity that most people experience at the same time. You've had the training, now it's time for the real thing. Step up the pace on your first full day safari, driving your team through snow-laden forests and across frozen lakes and rivers. Lunch will be served en-route around an open fire. By the end of this thrilling day, you will have covered 25km to 35km with your team of huskies. Taking full responsibility for your dedicated dog team, you head out an overnight trip into the wilderness. Driving through this unforgettable landscape, with the gentle swish of the sled's runners and the padding of the huskies' paws on the snow, you know you're creating memories that will be very hard to beat. As you and your dogs cross this dramatic winter world, add a little extra momentum by pushing off with your feet on the inclines and you will enjoy the boost in reaction from your team. At your overnight base, you are in charge of caring for the dogs; they need to be fed, watered and settled in for the night. At your cabin, once you collect firewood and water, the hard work is rewarded with a delicious dinner cooked over an open fire. 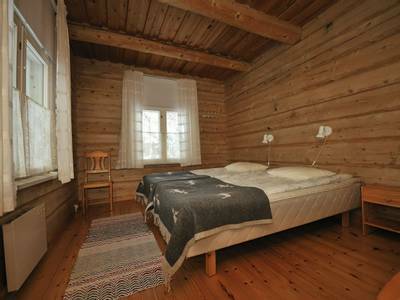 There's a sauna you can use and the cabin is really cosy once the fire is blazing. After such an exciting day and in the quiet of the wilderness, you should enjoy a blissful night's deep sleep. Your team will probably wake you with impatient barks. Once you and your dogs have had breakfast, it's back out onto the sled for more breathtaking scenery. There will be a lunch stop around an open fire and more mushing all the way back to the lodge. A shower and a hot dinner will feel like luxuries after your time in the wilds. A final full day to spend however you please – and you may well want to just take it easy and relax after your husky adventure. If you still have some energy and want to make the most of every moment, take advantage of the cross-country ski and snowshoe trails which surround the hotel, exploring the landscape on a guided tour (see the ‘Personalise’ section). You can also try an additional guided activity such as snowmobiling which can be booked locally. Whatever you do, make sure you take some time to sit back, relax, and just "be" in one of our planet's most enchanting places. Say goodbye to Saija and transfer to the airport for your return flights. Departure dates after 14th January 2018 also include a night in a snow igloo. Delightfully located on the shores of Lake Jokijarvi, Saija Lodge offers the much-welcomed guest a genuine sense of peace and quiet in the remote wilderness of North East Finland. The lakeside location also offers astounding views of snow-covered fells. Crafted completely from wood, Saija Lodge has a cosy, homely and comforting feel. A roaring fire and candlelight really set the tone. This ambience is accompanied by welcoming staff, wonderful home cooked food and plentiful space for unwinding after activities. All in all, it is the ideal location to really escape from the hustle and bustle of everyday life and serves as an excellent base for either a multi-activity adventure or a specialist husky safari into the surrounding wilderness. 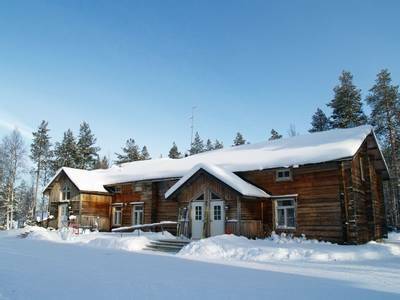 With traditional Finnish style, the main building of the lodge and its cabins are constructed entirely from wood, offering guests a rustic and warm charm. The restaurant is located in the main building, where your meals will be served. Here you can enjoy a variety of dishes including local produce such as reindeer and fish, in addition to delicious homemade pastries and bread. The lodge also boasts an on-site husky farm. With over 25km of managed cross-country ski trails close by, you can hire skis for a small fee from reception if you have some experience. 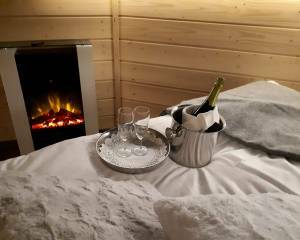 There is also a traditional smoke sauna on-site, which can be heated on request for guests to enjoy. The accommodation at Saija consists of 19 suites, which are located in several winter cottages, separate to the main building. 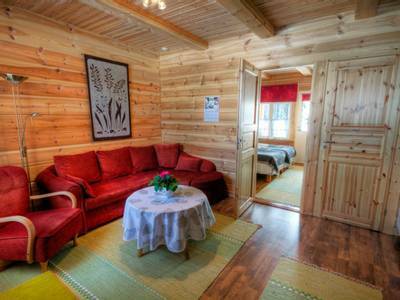 Each suite consists of a living area, shower room, toilet and private sauna. The sleeping area is situated on a separate mezzanine level. For trips including an overnight husky safari, one night will be spent at Harjajarvi wilderness cabin. 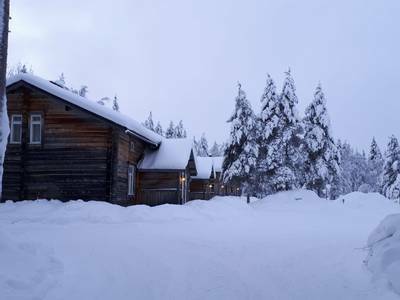 This is a very remote site with no electricity or running water, however, you will experience instant warmth from a log burning fire and the sauna. Experience a wonderful sense of escapism. All meals will be prepared by your guide over the open fire. During your time in the wilderness, you will also be responsible for your own team of dogs and will prepare their food. Wilderness cabin accommodation is reserved for those people enjoying overnight safaris. There can surely be few better forms of escape from the everyday stresses (which could include laptops, mobiles and your day job) than a night in one of these cabins. Their isolation also means that the views of the night sky are incredible. The Northern Lights could well pay you a visit should conditions be right and, if the sky is clear, you will never forget the sight of the galaxy overhead. The title is fairly self-explanatory as the cabins are located in the wilds. The cabins that you visit are determined by the conditions of the trails you are using. 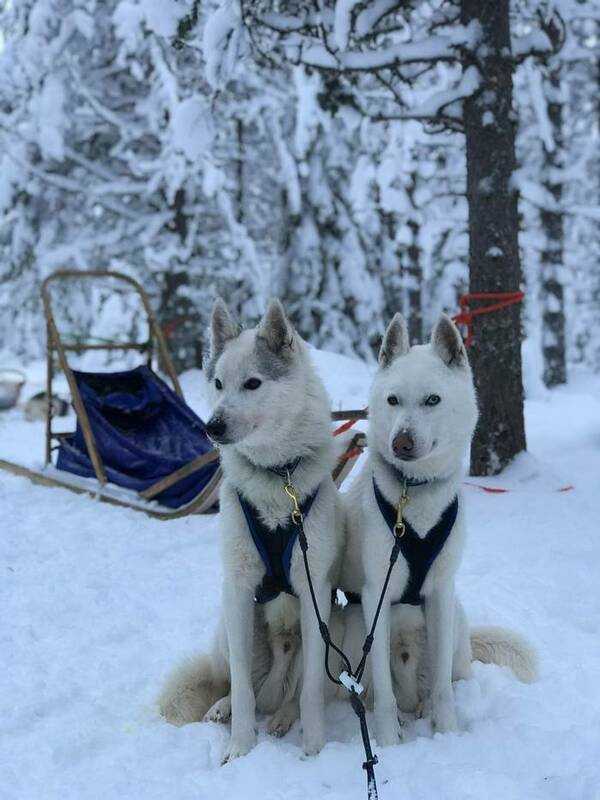 They are varied in their set up but all offer the same incredible experience of complete silence in the evening (not guaranteed if you are dog sledding as the huskies do like a howl now and then!). 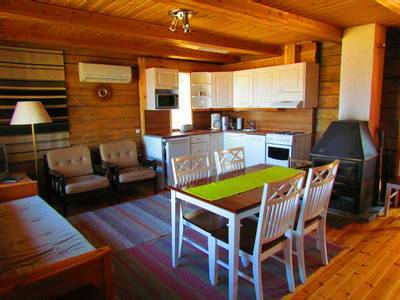 Some of the cabins are more basic than others, as some have no electricity or running water. Everyone will join the guide to help set up camp by collecting wood and water if needed. Participating enhances the wilderness experience. Once the fire is lit, the food is cooked. The guides prepare your meals over an open fire and our guests always provide exceptional feedback on the meals that the guides rustle up. Should you have specific dietary requirements, please mention these at the time of booking. There are no showers or bathroom facilities in the cabins but this is all part of the adventure. 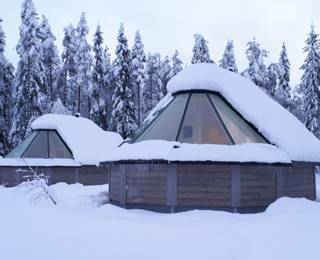 Scandinavia is renowned for its saunas and the wilderness cabins are no exception. Once heated, you can steam clean in the sauna. The toilet facilities are normally a short walk from the cabin and are compostable. 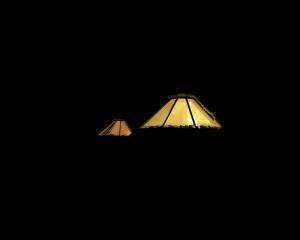 We certainly recommend a head torch for any ventures to the toilet during the night! In most cases, the sleeping arrangements are dormitory style. You will be given your own arctic-grade sleeping bag in which to sleep and, combined with your thermals and the open fire, this should keep you lovely and warm. You will carry with you all that you need for any stay in the cabins, so luggage is typically restricted to the essentials. Your main bag will be securely stored back at the hotel and a safe is provided for your valuables. There is something so refreshing about realising that you can strip back your belongings and enjoy such a simple but satisfying experience. Depending on the weather conditions you might spend the nights in cosy and warm basecamp tents at one of the wilderness camps. Why not spend an evening gazing at the Arctic sky from the warmth of your bed, by staying overnight in one of Saija’s ‘Sky Cabins’. Designed with a panoramic window that stretches to the roof, and with a double bed positioned beneath it, the cabins provide excellent views of the firmament above. There is something wonderfully relaxing about watching snowflakes drift past the glass roof, or on a clear night, admiring the glittering stars from the warmth of your cabin. Add the excitement of watching out for the Northern Lights into the mix, and you have yourself a perfect evening. Saija’s cabins are positioned on a lakeshore, offering a vast expanse of the non-light polluted sky to act as the perfect backdrop for a potential display. They are just as well-equipped as a hotel room would be, with a double bed, a sofa bed, an ensuite bathroom and a private sauna. Snowshoeing offers the chance to get up close to nature and experience it at a slower pace. On this trip, your guide will lead the way on snowshoes and you will be out in the wilderness for around three hours. Your guide will highlight any animal tracks and provide you with information about the region as you walk amongst the snow-covered trees. En-route you will break for warm drinks around the campfire. Reindeers are synonymous with Lapland and have been herded for centuries, forming an intrinsic link with both the Sámi people and North Finland. This insightful activity will allow you to experience a working reindeer farm. At the farm, you will be able to get up close with these gentle creatures and there will be opportunities to take photographs. You can also ask the herder any questions you may have about his reindeer and life up here above the Arctic Circle. This is sure to be an interesting experience for the entire group. Venturing to the frozen lake you will be given an introduction to the classic Nordic pastime of Ice Fishing. Your guide will explain the techniques which include drilling a hole through the ice and setting up a line. Hot Drinks will be served around a campfire as you wait patiently for a fish to bite. It is incredibly rewarding to make a catch, but the surrounding scenery and stunning snow-covered horizon add to this unique experience. For those who desire a more unconventional method of exploring the snowy wilderness then why not enjoy a unique tour by Fat Bike. This relatively new activity has grown in popularity over the last few years and allows for cycling through deep snow, on frozen lakes and through forested tracks. The chunky tyres have extra grip and allow you to cut through the snow with relative ease. This unique activity will allow you to cycle towards spectacular snow-covered horizons with incredible views of Finnish Lapland. The tour will include a stop for a coffee break near the rapids where you can spot various bird life and other natural wonders in this stunning winter wonderland. The thrill of husky safaris is almost impossible to resist, and it is quite likely that you may wish to add another to your itinerary. Full instruction is provided for each activity and guests will travel 1 person per team of dogs. 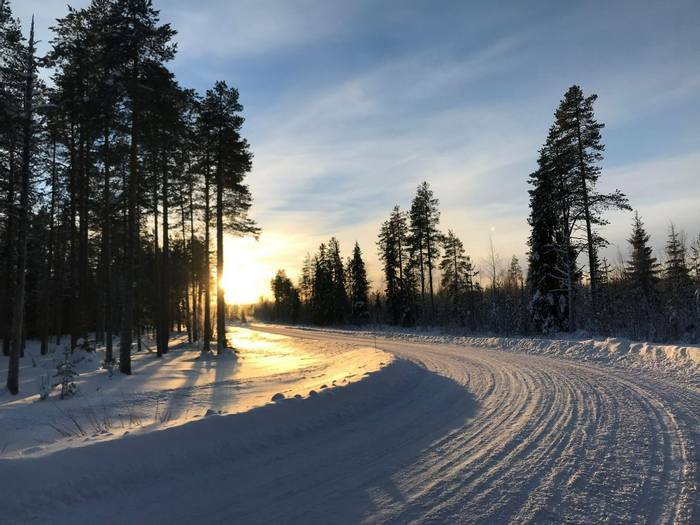 Cross-country skiing is nothing short of an obsession for many Finns and it is only when you experience the joy of gliding through the silent forests and fells that you really begin to understand why it is such an addictive pastime. Your guide will provide you with complete instruction so no experience of any kind of skiing is required. You will head out onto the trail for around two hours and explore the stunning scenery around Saija Lodge. If you are keen to keep the adventure going following your husky safari then why not try a thrilling snowmobile safari on your free day – a completely different way to experience this landscape. Following a full safety briefing, you'll depart on a safari covering around 60km with two people travelling per snowmobile. There will be spectacular views as you travel across frozen lakes and over the tops of fells. You will enjoy lunch around an open fire in a traditional wooden kota before returning to Saija lodge. If on your free day you would like to try something completely different to dog sledding, then a snowmobile is not only an efficient way to make the most of the vast scenery here but also exceptionally good fun. Following a full safety briefing, you will set off on one of the many trails that criss-cross the forests and fells, travelling two people per snowmobile. This 30km safari is a great introductory snowmobile tour and there will be a break for coffee around a campfire. Saija has a range of snowshoe and cross-country ski tracks on the doorstep with various lengths from 4km to 25km. The incredible landscape of frozen lakes and forest-covered fells provide a wonderful opportunity to enjoy a scenic route across the snow. The snowshoes or cross-country skis will be yours for the day. You must speak with the staff about the local conditions, inform them of your plans and take a mobile phone with you on any trip that you take independently. You should have completed a guided snowshoe or cross-country ski trip previously if you would like to hire the equipment. Read more Guides and all staff at Saija were knowledgeable and helpful. Working with my own team of six huskies was so rewarding. Excellent facility and most enjoyable programme of dog sledding. Thoroughly recommended. Everything was unbelievable; the quality of this holiday cannot be exaggerated. The organisation of flights, transfers and accommodation was superb. The safari activity was beyond expectations in all aspects and the people we met could not have been more helpful and friendly. We enjoyed every minute of every day. Read more dog team over the four days. We also did the long skidoo run. Great fun but we preferred the huskies because it was quieter. Fabulous holiday, activities and location. The lack of large numbers of holiday makers adds to the location's charm - sorry that sounds selfish! Read more was much more luxurious than I had anticipated, a very welcome treat.Jano was our guide but they are all brilliant at what they do & really helpful and informative. All of the meals were included and were delicious - I am sure we all returned home a little fatter.We booked the Husky Safari which was truly amazing and definitely the best bit for me. There are about a 100 dogs there - all really well looked after, loved, happy to be there, and happy to work. It is amazing spending time with them and the sledging and overnight safari really were a once in a lifetime experience. It is brilliant seeing how the dogs and guides interact - this is truly a labour of love. Thank you for an absolutely amazing holiday!